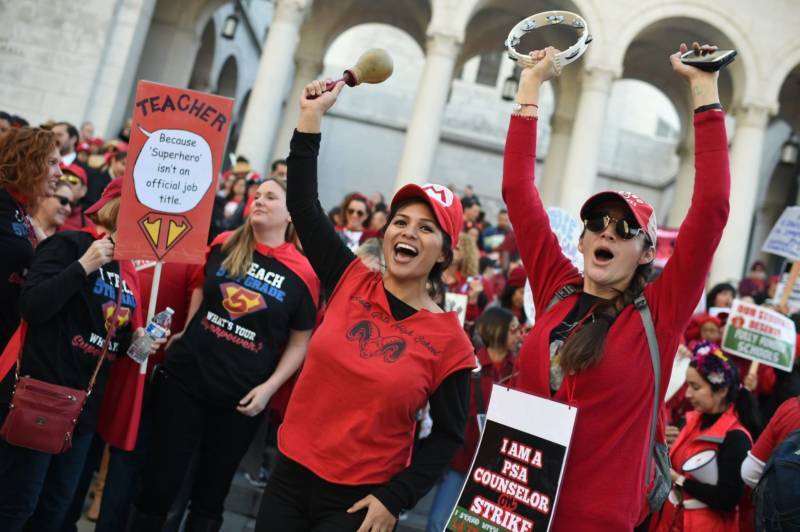 A tentative deal reached Tuesday between Los Angeles school officials and the teachers union will allow educators to return to classrooms after a six-day strike in the nation's second-largest district, officials said. "I'm proud to announce that, pending approval by the teachers represented by [the union] and educational professionals and this Board of Education, we have an agreement that will allow our teachers to go back to work on the campuses tomorrow," Garcetti said. UTLA president Alex Caputo-Pearl said teachers would vote Tuesday, and he expected approval. Teachers planned to meet with union representatives to familiarize themselves with the agreement before casting ballots later in the day. It wasn't clear when the results would be known, but teachers are expected to be back at work on Wednesday. The deal was broadly described by officials at the news conference as including a 6 percent pay hike and a commitment to reduce class sizes over four years. Details were promised to be released later. Teacher Marianne O'Brien said she was ready to support the contract but would consider voting no if schools don't get additional support staff. "This is not just for teachers. It's also for counselors, nurses, psychologists and social workers," said O'Brien, who teaches 10th-grade English. District Superintendent Austin Beutner said he was delighted the deal was reached. But he hinted that financial challenges remained as he pledged to invest every nickel the district has while maintaining fiscal solvency. Some teachers were already declaring victory despite a lack of specifics about the new contract. Thousands of boisterous striking teachers, many wearing red, and their supporters gathered on the steps outside City Hall. The crowd began roaring, blowing horns and chanting the initials of Caputo-Pearl as the smiling union leader emerged from the building and walked through the throng. Joaquin Flores, a special education teacher, said from what he'd been told teachers were getting a lot of what they asked for. He believed he would support the deal unless it weakened health care or didn't go far enough to reduce class size. "I suspect the motives of Beutner," Maloney said. "If he doesn't release some of that $2 billion and there's no understanding for moving forward, how he's going to cut out this crap that we're running at a deficit and yet our reserves are going up every year."